Photo source: Filipe Fortes. Some rights reserved. Map source: People Group Location from Asia Harvest. Other map data / geography from GMI. Map by Joshua Project. The Tujia, whose name means "natives" or "original inhabitants," are one of China's officially recognized nationalities. 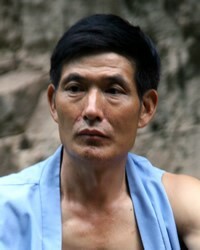 Most Tujia today are ethnically indistinguishable from the Han Chinese. The vast majority have been assimilated since the Ming Dynasty (1368-1644) when they were sent as soldiers to fight Japanese pirates on the east coast of China. Only 170,000 Tujia are able to speak their language. The rest speak Chinese or the local dialect of Ghao-Xong. 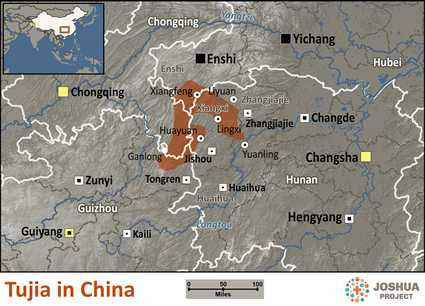 Speakers of Tujia are concentrated mainly in the Youshuihe, Mengdonghe, and Xichehe river areas of the Xiangxi Prefecture in Hunan Province. In these areas education is conducted in the Tujia language until the third grade; after that, Mandarin is used. It is possible the Tujia once possessed a script which may have been lost as they assimilated to Chinese culture. In 1890 the British Consul Borne discovered a document in an unknown script. Borne was located at Tchong-Kiu - present day Zhong County in eastern Sichuan - north of the Tujia area. The speakers of Northern Tujia call themselves Bizika, while Southern Tujia speakers call themselves Mozhihei. There are several theories about the origin of the Tujia. Some say they are the descendants of the ancient Ba tribe. Many Tujia still call themselves Ba. By the early 900s the Tujia were already recognized as a distinct people group in western Hunan. One of the common motifs on Tujia embroidery is the bull's eye. This refers to a Tujia legend, which relates how one autumn day a herd of bulls was attacked by a tiger while grazing on a mountain slope. "At first sight of the tiger, the bulls were startled, even frightened, but they soon regained their composure. The bulls then charged at the tiger, which fled in panic. To this day the Tujia regard the bull's eye as a symbol of the victory of good over evil. Other common motifs include the snake and the white tiger since these were the totems of the Ba tribe." The Tujia of Guizhou practice nuo (exorcism) ceremonies. The Tujia evoke the spirits of Fuxi and Nuwa - the first human beings according to Chinese legend. The ceremony includes supernatural feats such as climbing ladders of sharp knives and walking on hot coals or glass. Roman Catholic and Protestant missionaries first entered Tujia areas with the gospel near the end of the nineteenth century and established a small number of churches, schools, and medical clinics among the Tujia. Today it is estimated that there are between 13,000 and 30,000 Tujia Christians, a tiny proportion for such a large group. View Tujia in all countries. 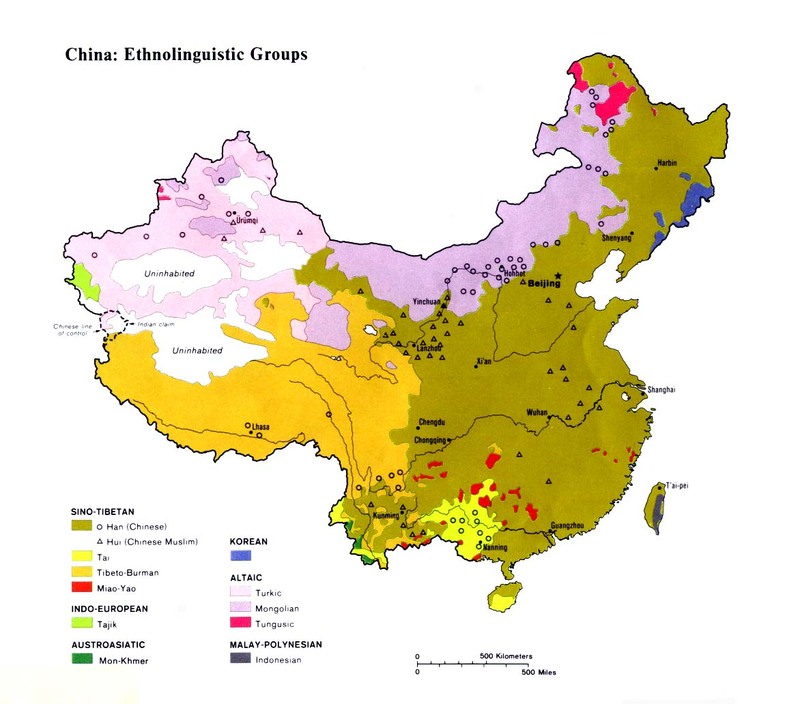 Location in Country: More than 5.7 million members of the Tujia nationality were reported in the 1990 census. They live at the juncture of Guizhou, Hunan, Hubei, and Sichuan provinces. The population given for the Tujia doubled between 1982 - when they numbered 2.8 million - and 1990. This was due more to the redefinition of minority status by the Chinese authorities than to biological growth.